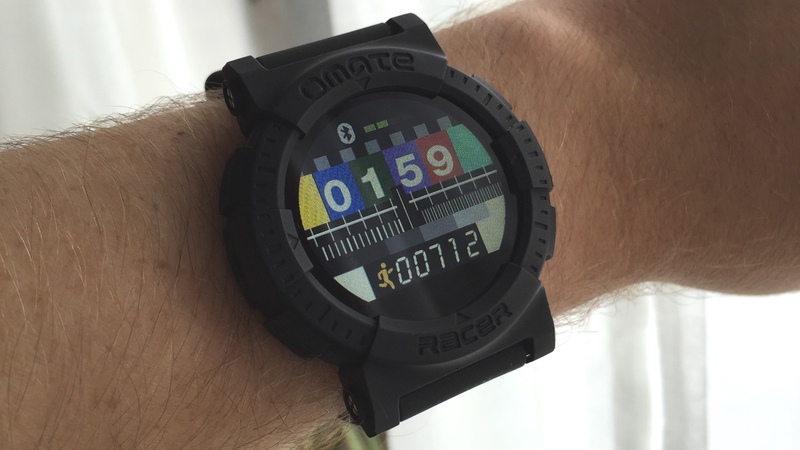 The Omate Racer is a hard one to categorise. Born from the same stable that brought us the TrueSmart smartwatch in 2013 and the stylish Omate X and the Lutetia duo in 2014; the Omate Racer is the New York company's rugged number, unashamedly aimed at the male masses who haven't yet made the smartwatch jump. While it's not as feature-ridden as its Android Wear and Apple-powered rivals, it's got more mobile savviness than the glorified stylish fitness trackers from the likes of Mondaine and Withings. 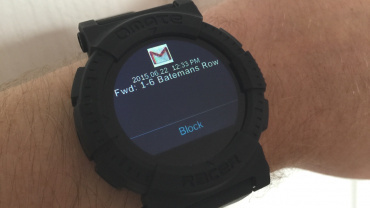 At $129, the Omate Racer is pretty cheap but is it functional? Wareable has had one strapped on for a couple of weeks now, read on to find out. The Omate Racer takes its design cues from the likes of the Casio G-Shock or the Tissot PRC200. 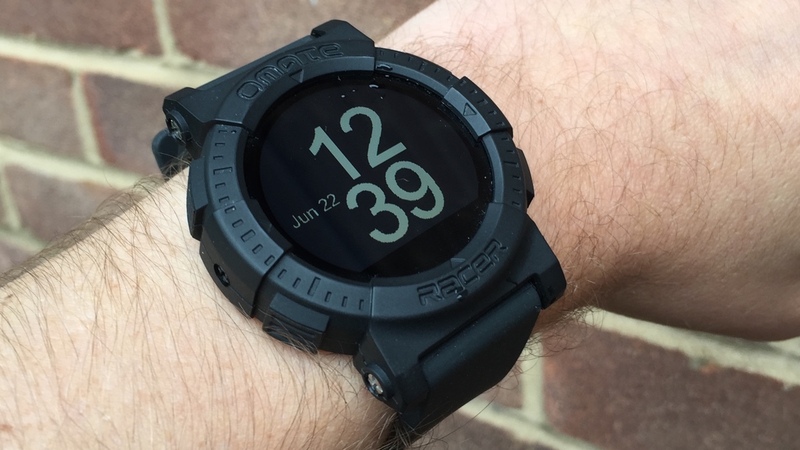 It's a sporty looking, rugged smartwatch with a rubberised bezel measuring 48 x 48mm. It's certainly not as premium as the two aforementioned regular watches; at $129 it's definitely a touch more high-street that high-end. There's only one active button – which acts as a standby switch, a backlight activator and the back key – the other five raised panels are merely mock buttons. Most of the controls are handled by the touchscreen. The looks are slightly tarnished by the big, easily visible screws on the side of the watch. Omate should have used black screws rather than silver, as these would have been less obvious. 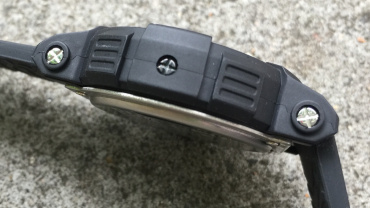 Overall it's a decent design and a comfortable fit thanks to the texturised 22mm rubber strap, but is does feel a bit more prototype than polished article. The display is a 1.22-inch capacitive touch one. Omate has kept quiet on the resolution but we can tell you this – it's low. Graphics looks pretty pixelated and colours are far from vibrant. It's not unreadable by any stretch but it isn't going to impress anyone either. The backlight improves things a bit but is very much a temporary measure. The touch screen works ok, you can scroll through the various features with little resistance, but it's not the same level of slick responsiveness you'd expect from Apple or Android Wear smartwatches. On the whole, the round design of the display works without issue but we did find that some screens, particularly the settings menu did bleed over the edges, which is obviously a software flaw. Running its own operating system dubbed Nucleus (not the one from Silicon Valley), the idea is to keep things as simple as possible. And, on this front, the Racer succeeds. It tells the time – with eight different watch faces on offer; it offers basic pedometer statistics for your step counting obsession (with questionable accuracy) and it also offers a wide variety of smartphone-linked notifications (both iOS and Android are supported, and we've tested it with both). 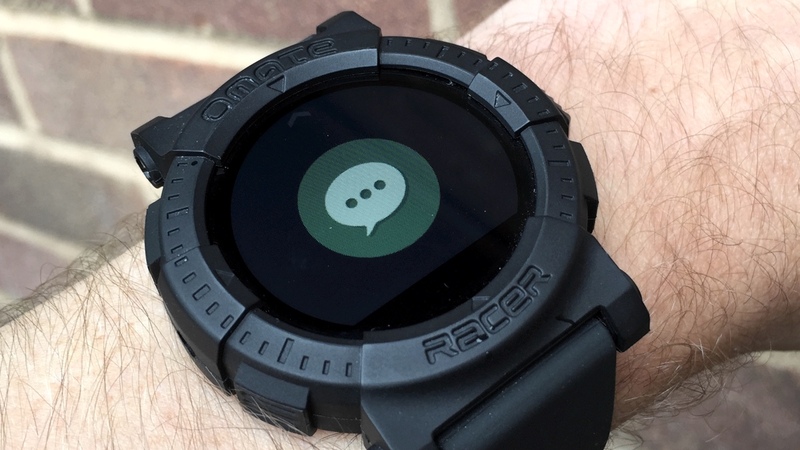 Unlike some budget smartwatches we've seen, these notifications aren't just limited to the basics – texts, emails, calendar reminders and the like. 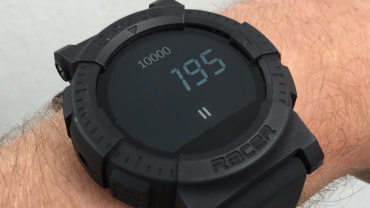 The whole hog of your smartphone life can be beamed over to the Racer using Bluetooth. In fact, to start with it's a pain narrowing down the ones you want. By default, the companion app turns on updates for every single app on your paired smartphone. And, not just your front facing apps either, but system apps too (think Android software files, widget frameworks, Google Play services and so on). On Android there's about 150 things to untick before the Racer will stop buzzing like a single lady's top bedside draw after an earthquake. Once you have whittled down the notifications to the ones you want it's a much more pleasant affair and you'll be alerted as and when notifications hit your phone. The system is a bit buggy, however, and you sometimes get the same update twice, and deleting viewed updates isn't as easy as it should be. As well as the notifications you can also use the Racer to skip forward and backward your phone's music. Unfortunately, album artwork and song info doesn't seem to be supported at present, and it only works with the default music player, not streaming apps like Spotify. 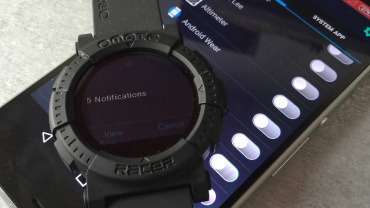 The Omate Racer packs in a dual-core ARM-based MediaTek processor, which the company boasts is the smallest wearable chip in the world. The system runs smoothly enough and the battery life, around two days when paired, is pretty good. You charge using a magnetic dock – in fact, the whole back of the watch itself is magnetic so you can stick it on your fridge if you want. Go nuts. It's probably not a great idea to keep it near your smartphone though. The Omate Racer is an attempt to cash in on the smartwatch revolution by offering people a stepping-stone to full-featured devices powered by Apple, Google and co. It simply promises to tell the time and keep you updated with what’s going on with your smartphone using real-time notifications, and it just about succeeds. It’s not a polished device by any stretch, and the slightly clumsy design and buggy software sometimes gives off a whiff of prototypeness but, at $129, it’s a decent option for anyone looking to dip their toe in the warming waters of wearable tech. Don’t expect any frills and you won’t be disappointed.